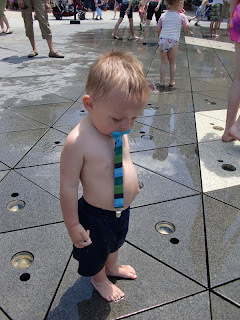 Yesterday I met up with some other moms from church to let our kids play in the Fountains at the Gateway in Salt Lake. When we got there, it was just past noon, and come to find out there was a Jr. High orchestra concert going on. Really? So all of our kids ran wild for an HOUR and I was ready to go by then. The fountains finally turned on and Chandler was ecstatic. Rowan took a little bit to warm up to them but was soon playing in them too. I would have liked to be Rowan at this point. I was sooo hot and sweaty that I was envying all those little kids in the fountains. Sounds like a lot of fun...especially in this warm weather we've had! Looks like fun! I wanted to go, but had a doctor appointment to go to instead! Hopefully next time though! How are things going for you?! Haven't talked to you for a long time! 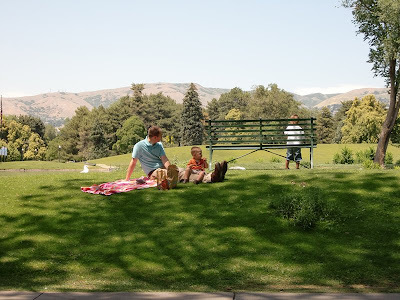 Liberty park has the streams of the canyons in the middle that the boys can play in. There is also the zoo and heritage park. Maybe we can do heritage park when I come down if you don't have to much to do. Hmm lets see.. this weekend there will be tons of parades, firework shows, entertainment all around the valley. Get online I am sure you have heard some advertisements on the radio. The 24th of July celebration is huge & Liberty park has a big celebration that day. with vendors etc. That sounds like such a nice day! Glad you could get out and have some fun. HOw fun! I'm glad you're having a fun summer. Have you tried taking the boys to Story Time at the Lehi Library? Also, we sometimes just wander around Cabela's. Or South Towne Mall has a fun little dinosaur place. I'm trying to think of indoor things bcs it's too hot outside!! It was fun at the Gateway - I'm glad you guys came!